3 years & up. The colorful math game that grows with your child! Learn counting, early numeracy, arithmetic and logic through different suits of colorful cards formatted with big and little dots, frames, circles, doubles plus one, numerals, and dice patterns. 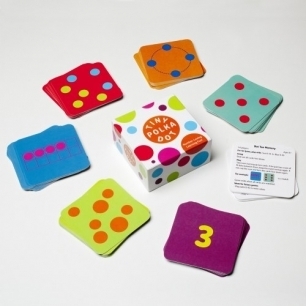 Start with the Hungry Numbers suit and teach children how to feed dot cards to their corresponding numerals. As children get more familiar with numbers and basic mathematical formulas you can move them on to the more advanced suits. Each suit builds off of the other. Good for 1-6 players. Card size: 3.5" x 3.5".